One of Strauss’s largest orchestral works, An Alpine Symphony, will take you on a dawn-todusk hike in the Bavarian Alps, while young Thai composer Wiwat Suthiyam, inspired by the famous Thai painter Thawan Duchanee, sonically depicts Duchanee’s paintings of fog, mist, and legendary creatures in his Dhumketu. Linking the mountains and the mist is Beethoven’s magnificent First Piano Concerto in the compelling hands of German pianist Rolf-Dieter Arens. The acclaimed Maestro Johannes Klumpp takes the helm in this Alpine adventure. Beethoven’s assertive originality struck his contemporaries like a thunderbolt and it continues to excite us for its subtle and profound musical intelligence. His magnificent First Piano Concerto, in the compelling hands of German pianist Rolf-Dieter Arens under the baton of countryman Johannes Klumpp, links the music of two seemingly disparate compositions: Wiwat Suthiyam’s Dhumketu and Richard Strauss’ Alpine Symphony. Yet, they find common ground in expertly blending philosophical musing with brilliant orchestral virtuosity. The lauded pianist Rolf-Dieter Arens has worked with some of the most brilliant conductors of our times, including Kurt Mazur and Sir Neville Marriner. 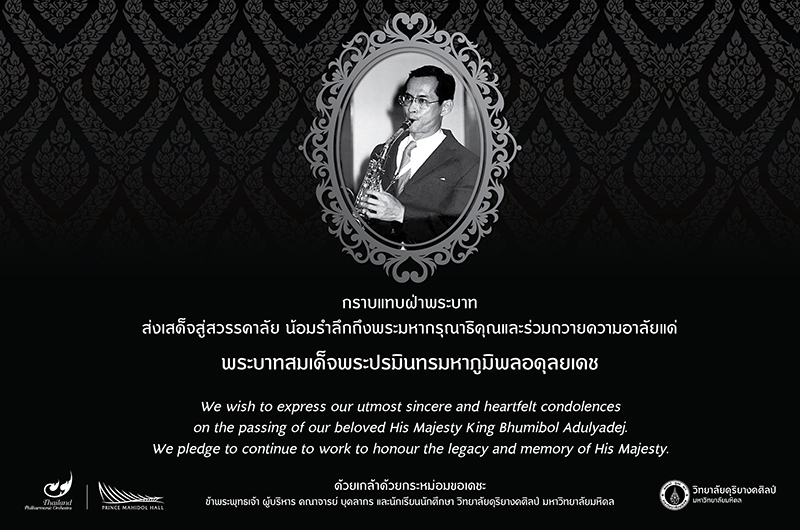 He is well known to Thai audiences for expert performances of German piano repertoire in past seasons. The young maestro Johannes Klumpp is a rising star whose performances have led critics to hail his work as “precise, rousing and deeply personal”. These qualities will all be on display in Strauss’ programmatic ode to nature – The Alpine Symphony. 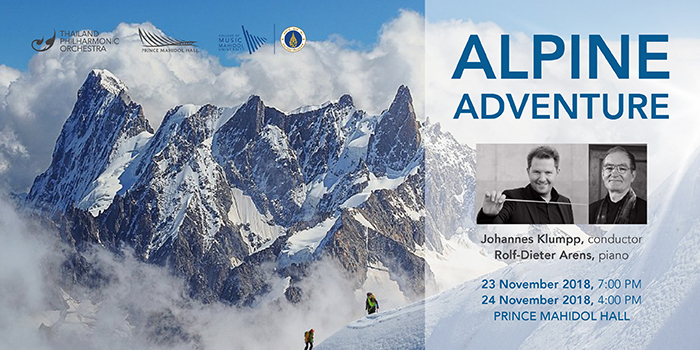 “Alpine Adventure” concerts take place on 23 November at 7 PM and again on 24 November at 4 PM in Prince Mahidol Hall.